www.Coupons.com reached out to me and asked if I had any ideas for a Back-To-School Mommy Hack and when they did, my mind started reeling! By hacks, they simply mean things that mom can do to get ready for go back to school time for the kids. Things to make life easier. Now, you all know that my little one is a ways away from starting school, but I find no harm in preparing early. Primarily because I know I am going to be an emotional basket case the day she boards the bus for the first time. Or I pack her lunch for the first time. Or I buy her her first pencil box. Woe is me. We should probably move on before the waterworks starts. When I was younger, we took an annual photo on the first day of school so we could see how much we changed over the years. The only problem is: unless there was a time/date stamp on the photo (that is... if your parents could figure out how to SET the date and time) or if you had a drastic change, you didn't really know which school year you were starting! 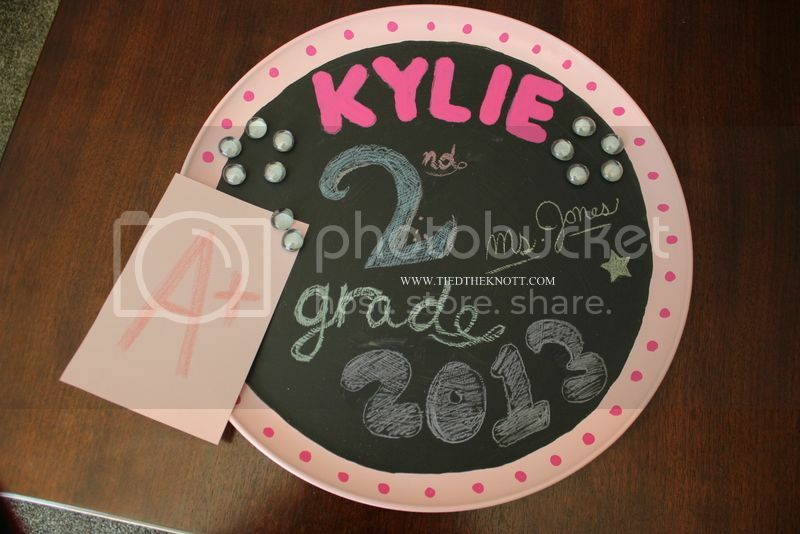 This chalkboard is really multi-purpose. You can write the kiddo's grade, teacher, and other first-day, photo-necessary details AS WELL AS use it as a magnetic board so you can pin up awards, report cards, and other proud moments. You can display this board multiple ways: on a frame stand, drill holes and hang... really it's up to you and your preference. This project took about two hours and cost about $20 (but most of the products can be used for other projects as well). Take your pan and rub it down quick with the sandpaper. This will eliminate some of the non-stickiness and help the paint to stay. Wipe it down with a wet washcloth, let dry, and move to the next step. 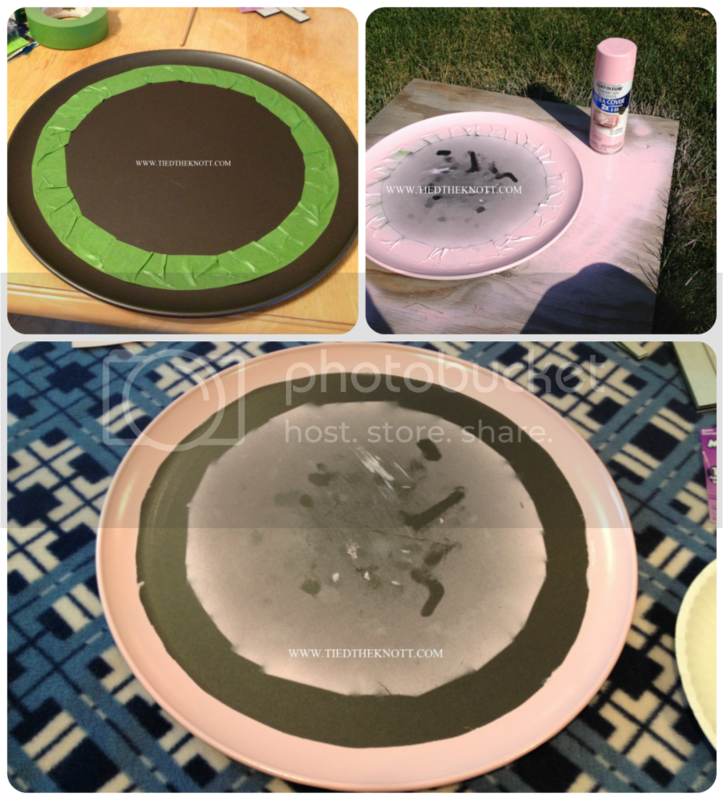 On your pizza pan, tape a large round circle so you have room for a border that you will paint. This can be as large or as thick as you want. Once taped, you will spray around the outside. Don't worry about getting paint in the middle. You will cover it with chalkboard paint soon enough. 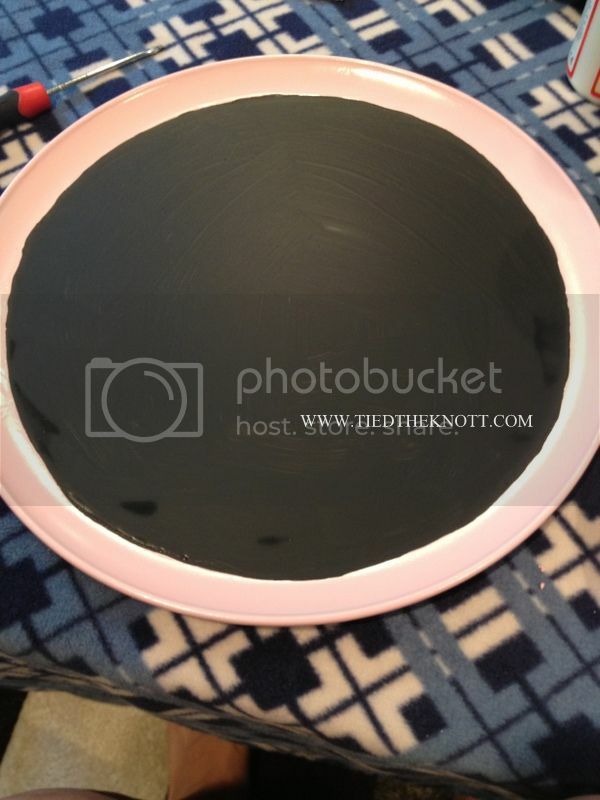 Once dried, use your sponge paint brush to paint on your chalkboard paint in the center of your border. Don't be afraid to do two coats here. Let it dry completely. Once the paint is dry, you can start to stencil with the acrylic paint. 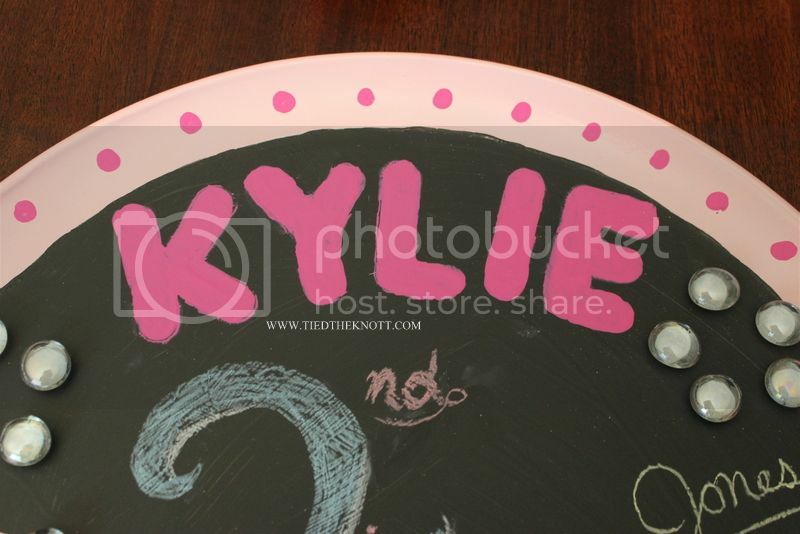 I wrote Kylie's name (you can make one for each kiddo!) so that someday i can hang it in her room and she know that this was made special for her. I also added dots to the border to dress it up a little. Let this dry completely. While that is drying, you can work on making your magnets. Instructions for that are below! Finally, when everything is dry, you get to write on the board, take a picture of your kiddo standing next to it, and stick your child's achievements to it! Something you can be proud of now, and they can be proud of later! 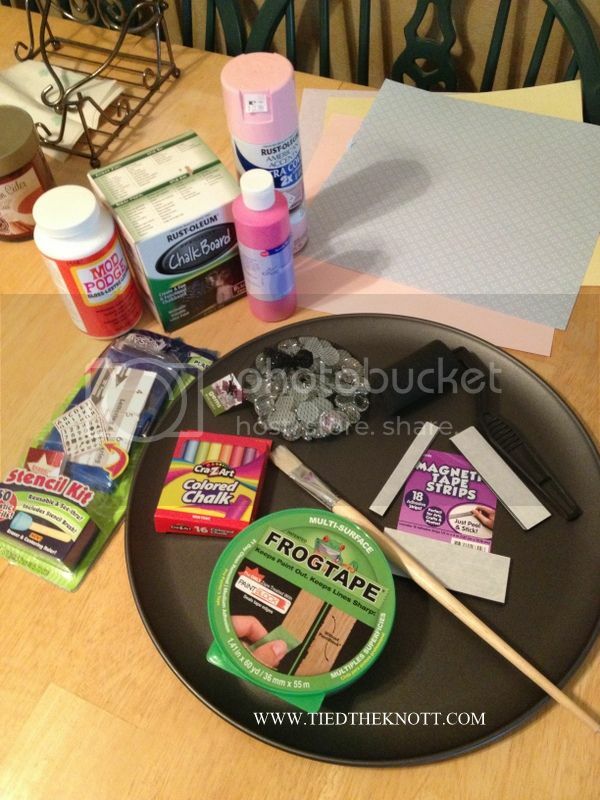 Cut your scrapbook paper and magnets into small round circles. Using a Q-tip, place a dot of mod podge on the colored side of the paper (the side you want exposed) and stick to the bottom of the marble. Using the Q-tip again, cover the entire piece of paper with mod podge and around the edges to give it a good, secure stick. 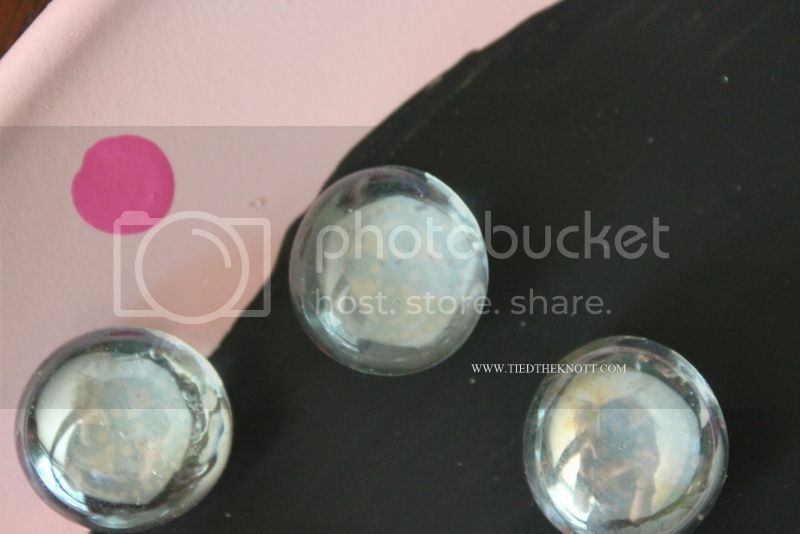 Let dry completely and to finish them up, take small circles of your magnet strips, remove the paper, and stick them to the bottom of your marble. Ah Melissa, I love this SO cute!!!! Need to remember to do this!